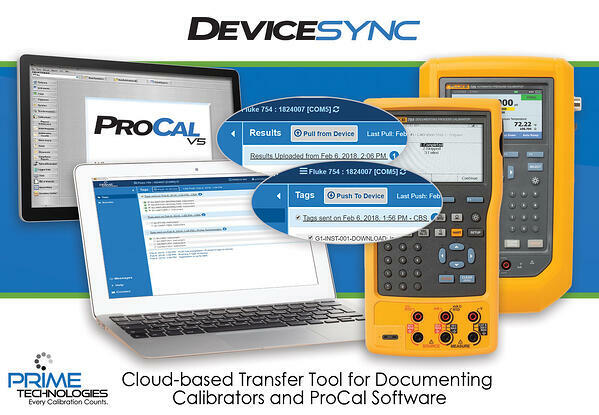 Prime Technologies Inc., developers of ProCalV5 Calibration Management Software, has announced the release of DeviceSync; a web-enabled application designed to provide a rapid and secure method for data transfer with documenting calibrators. Calibration assignments and results move back and forth via a cloud connection enabling robust and performant workflows for remote technicians with any internet connection, while preserving usability in completely offline environments. This allows more of an organization’s calibration workforce to take advantage of efficiency-doubling documenting calibrator devices. Downloaded tags are encrypted and saved securely at the local workstation, which will automatically pick up downloaded tags when online. The same easy assignment methods used in ProCalV5 can be used to transfer data to DeviceSync. Completed work results stored in DeviceSync are automatically transferred to the cloud with an active internet connection and subsequently pushed to the organization’s ProCalV5 or hosted ProCal Direct system. Software required includes standard Windows OS, DeviceSync and ProCalV5 or ProCal Direct (version 5.8.0.4 or higher). Any standard Windows based PC hardware will suffice including tablet or convertible form factors. Compatible calibrators include Fluke 729 Documenting Pressure Calibrators, Fluke 743B, 744, 754 and 753 Documenting Process Calibrators, Honeywell 2020 and Beta 990 models. Founded in 1989, Prime Technologies Inc. is a worldwide leader in calibration management software. The company offers a wide range of products and services designed to provide “best in class” software to meet the most demanding data collection and IoT management challenges for the Process Control Industry.